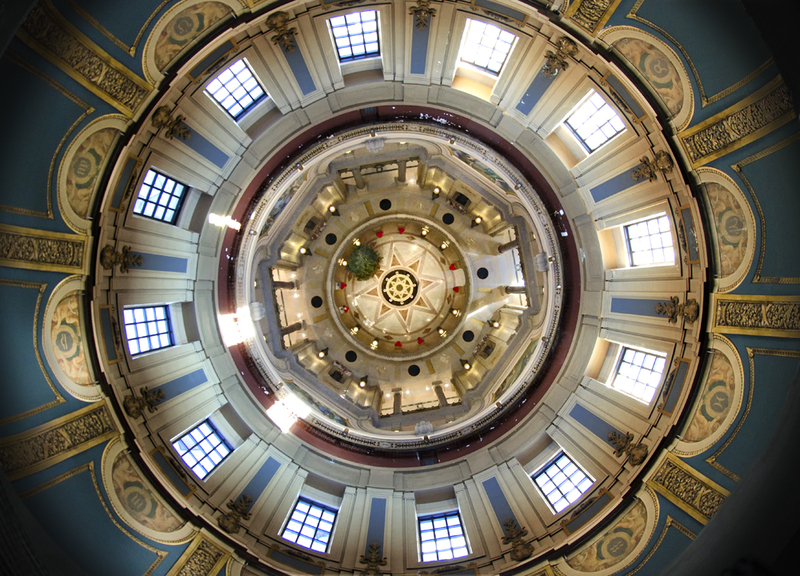 The State Capitol dome is actually a three-dome structure. The exterior one you can see on the outside, the interior one you can see in the rotunda and an unseen middle dome that keeps frost and water from damaging the interior dome. 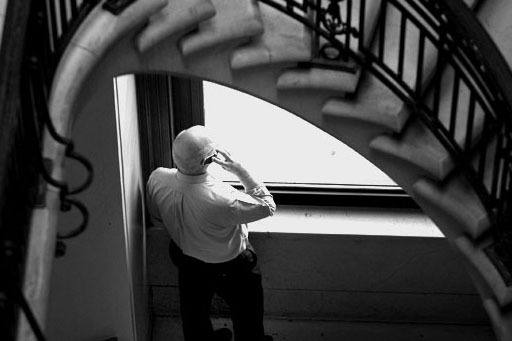 During the past few years workers have repaired the exterior dome to prevent water damage, installed a ventilation system to move the humidity out of the dome and new flashing for drainage was installed around the base of the middle dome to trap and remove water permeating from the exterior dome. 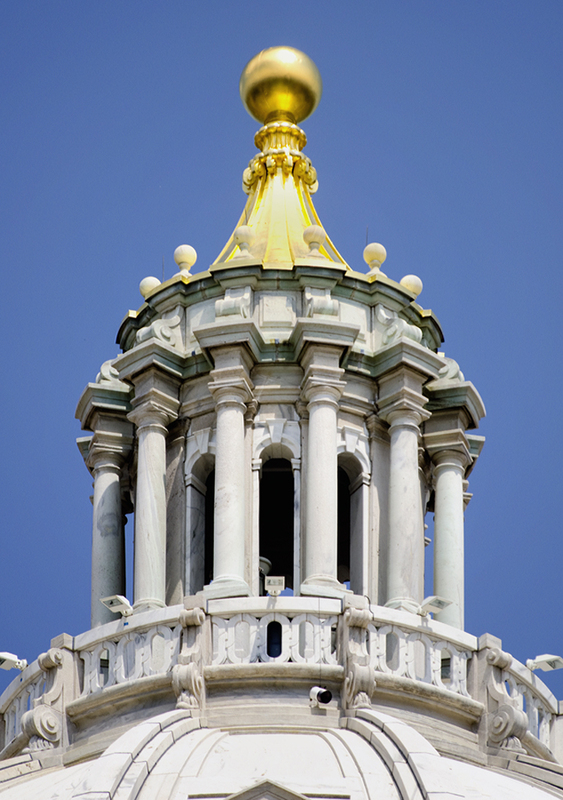 The finial (the golden ball at the top of the exterior dome) was repaired and new gold leaf applied, new windows were installed and the dome’s chandelier was cleaned and restored. But there is still another $260 million worth of repairs to be done to get Minnesota’s Capitol back into the shape it was when it opened in 1903. 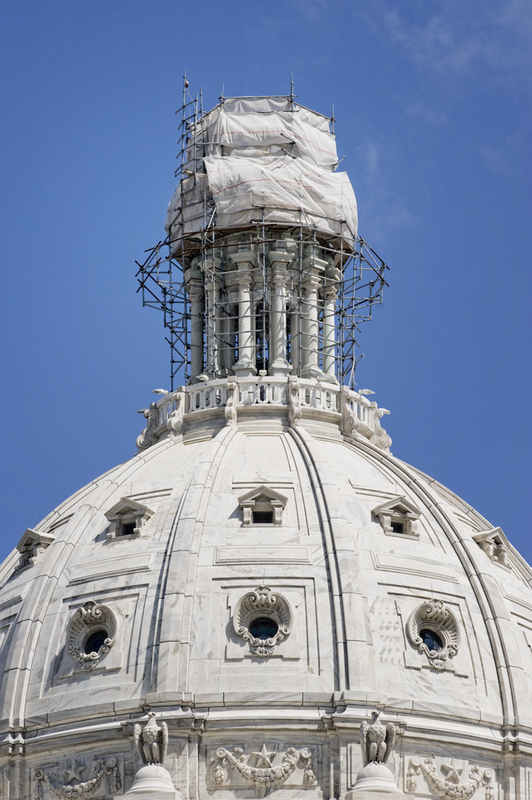 Inside a cocoon made of scaffolding wrapped in plastic atop the Minnesota State Capitol two workers painstakingly apply gold leaf to the lantern’s finial. 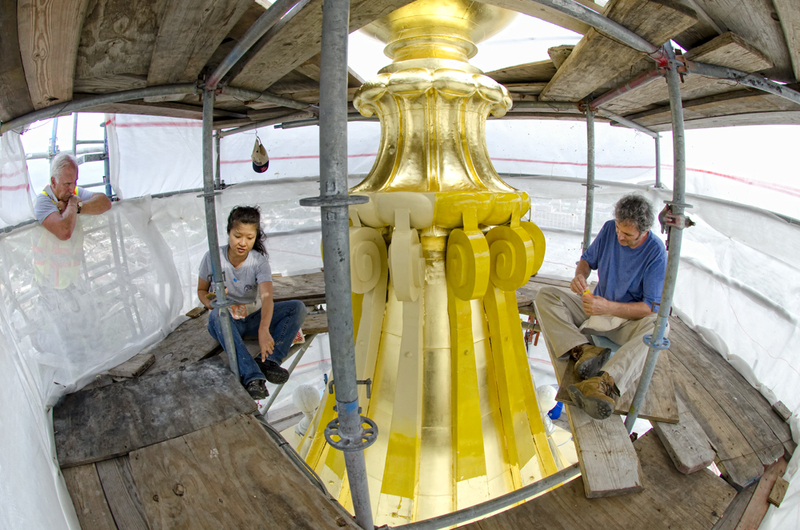 Heide Xu, center, tells Duane Olson, left, Capitol construction superintendent with JE Dunn Construction, that the wind is to strong to work on the lower portion of finial while Stoyko Stoykov, right, continues to apply gold leaf sheets to the middle portion of the finial. 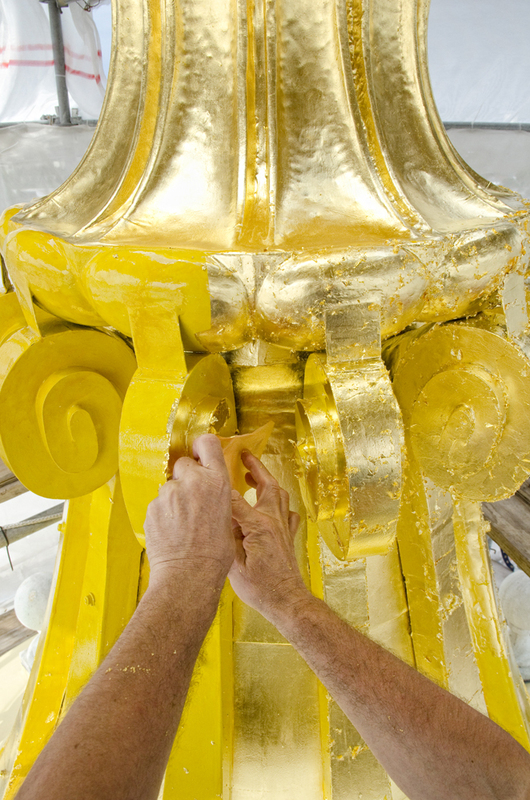 After the gold leaf is applied to finial it is smoothed into place with a brush. 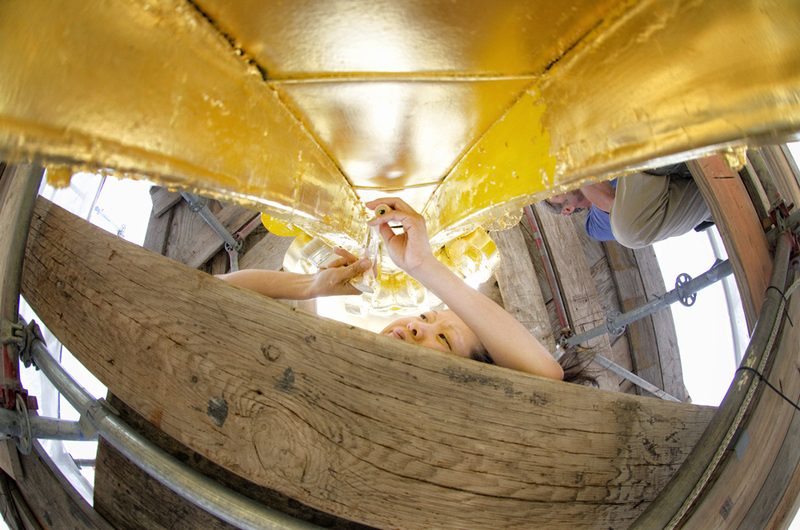 Heidi Xu, of Evergreene Architectural Arts in New York, lays on her stomach to apply gold leaf to a portion of the finial. 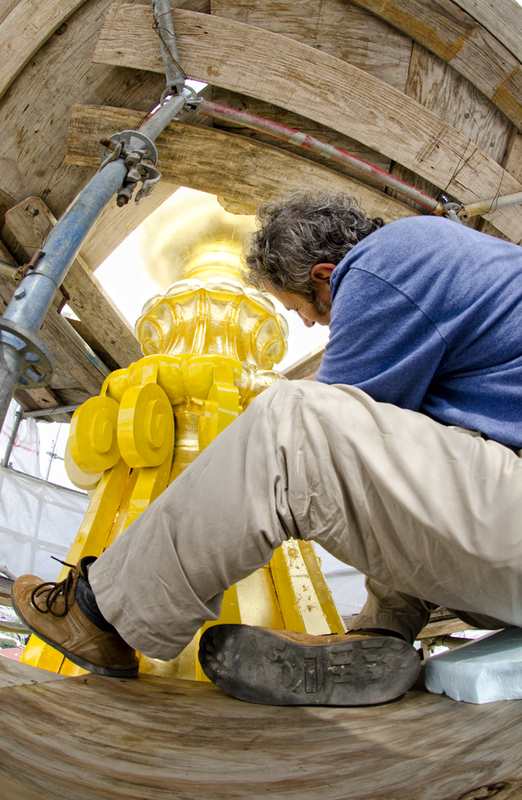 Stoyko Stoykov applies gold leaf to the center section of the finial. 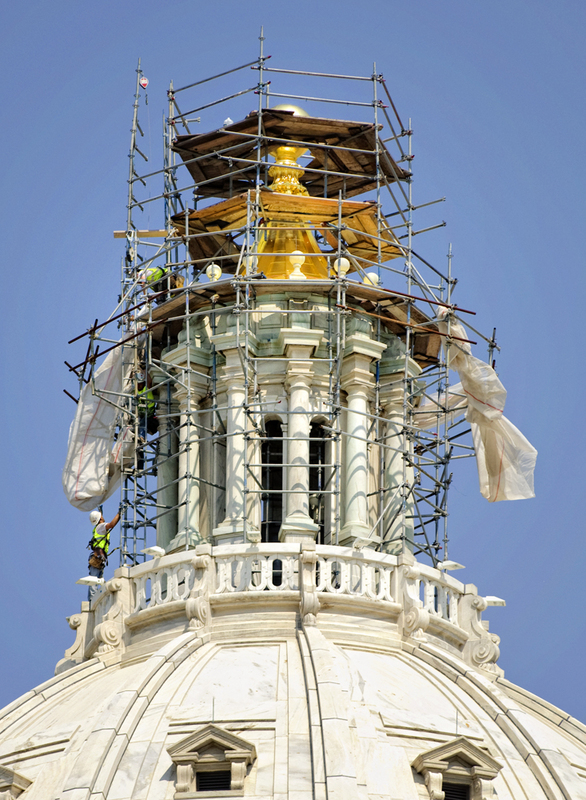 Workman remove the drape that covered the Capitol landern finial after repairs were made and the dome’s ornaments was recovered in gold leaf. 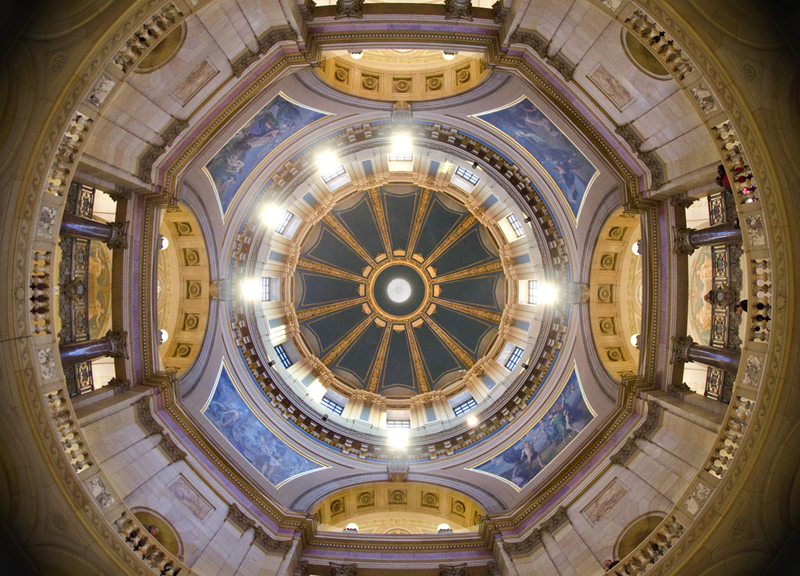 This is a look at the interior dome of the State Capitol after the chandelier was rehung during a Raising and Lighting Ceremony Jan. 17. The chandelier was removed in 2010 for cleaning and repairs. The chandelier is six feet high, 19 feet in circumference, holds 92 light bulbs and weights about one ton.